Mouse monoclonal antibodies raised against human C3b receptor-enriched precipitates from tonsil cell membranes. Biotin/FITC/PE/APC conjugated IgG buffered in PBS, 0.02% NaN3 and EIA grade BSA as a stabilizing protein to bring total protein concentration to 4-5 mg/ml. For all formats, store at 4 degree C. DO NOT FREEZE PE and APC conjugates. For long term storage (Purified, Biotin, FITC), aliquot and freeze unused portion at -20 degree C in volumes appropriate for single usage. Avoid freeze/thaw cycles. Small volumes of anti-CD35 antibody vial(s) may occasionally become entrapped in the seal of the product vial during shipment and storage. If necessary, briefly centrifuge the vial on a tabletop centrifuge to dislodge any liquid in the container`s cap. Certain products may require to ship with dry ice and additional dry ice fee may apply. 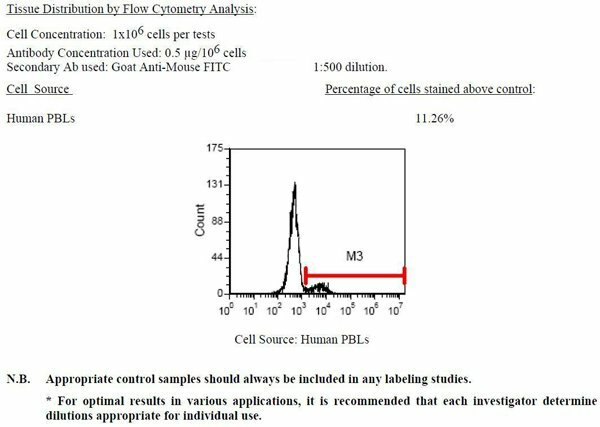 anti-Human CD35 monoclonal antibody specifically binds human CD35, also known as Complement receptor type 1 (CR1). CD35 is a membrane glycoprotein that binds C3b and C4b, and is expressed on granulocytes, monocytes, B cells, follicular dendritic cells, subsets of NK and T cells and erythrocytes. CD35's affinity for C3b plays a role in the inactivation of the alternative complement pathway by affecting the function of C3 convertase.